In Store Dove promotion is available only in Shoppers Drugmart locations. You can view all Shoppers Drug mart promotions on their website, in your ‘All Offers’ link. You don’t need a coupon to claim this Dove promotion, just need to purchase Dove go Fresh body wash and you will automatically get 10x the shoppers points. You do need a Shoppers Drugmart loyalty card tho. Dove promotion is get 10X the Shoppers Optimum bonus points when you purchase any Dove go Fresh body wash.
Dove promo is valid only in Shoppers Drugmart locations across Canada. Offer ends August 9, 2013. If you’re lucky you can find also a Dove go Fresh coupon to save $1 off your Dove go Fresh body wash here or save $0.50 off the in-store tear pad. Also if you purchase Dove go Fresh, you get a bonus entry for the Shoppers Dream Summer content. You can see details here. 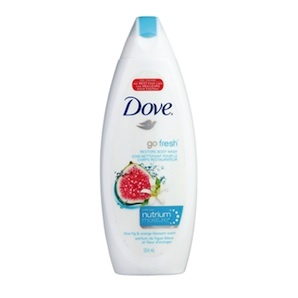 Dove go Fresh Restore body wash is Dove’s perfect balance of freshness and care. The welcoming scent of blue fig orange & blosson. Inspires your senses and leaves your skin feeling restored. Infused with Dove’s unique NutriumMoisture® technology, it goes beyond refreshment to effectively nourish skin.